You will code, build, and execute two programs requiring GUI. The first program will ask the user to input a password and then reenter it for verification. The second program is a number guessing game that generates a random number and asks the user to input his or her guess. 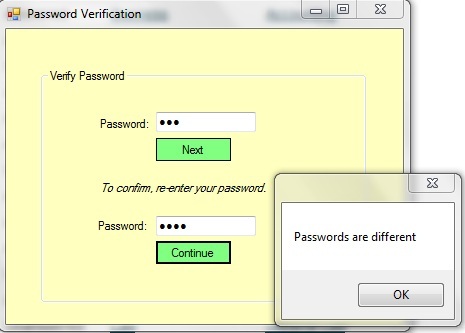 Write a Windows application that simulates entering a password. The user enters a password and clicks Next. 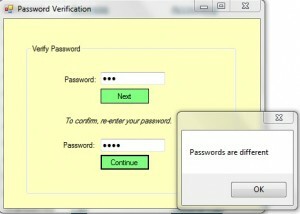 Then, the user types the password again and clicks Continue. The program will display a Message Box that displays either that the passwords match or that they don’t match. I type in Bob in the password field and click Next. I type in Bob in the second password field and click Continue. Best practice: First make sure to read through this week’s lecture and try it yourself! Then, you’ll be in good shape for this exercise. Write a Windows application that randomly generates a number from 0 through 100. Prompt the user to guess the number. Let the user know if the guess is too low, too high, or is the correct number. Give the user another chance to guess the number. The user keeps guessing until he or she gets it correct. I entered a number and pressed the button. I pressed the button and the box and message are cleared. The following message is displayed when the guess is right. 	Display a message indicating the user guessed correctly and display the number of guesses it took.